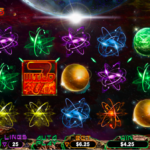 Nova 7s is a space-themed slot that was very recently launched by Realtime Gaming. It has a variety of wild feature mechanics along with a highly lucrative bonus round involving free spins. Space is one such theme that has been around for a long time and is still quite popular. The Nova 7’s is based on the solar activities across the universe. Thanks to the transparent reels, the cosmic animation catches your attention easily and along with giving you a clear view of the background. The symbols include stars, comets, planets, and asteroids. The sound effects are enough, though not excellent. This is a 5-reel game with 25 paylines. The four wild mechanics in the game are Nova, Super Nova, Hyper Nova, and Solar Flare. With a Solar Flare, the Red Nova 7s on the second and the fourth reels flare upwards and cover their reels. The Nova appears only on the third reel but awards the user 7x multipliers. It can flare and cover even the whole reel – this is Super Nova. The Hyper Nova occurs as an add-on to the Solar Flare. The top win is something that is seen very rarely – 38,073x the line bet. The blue Nova 7’s forms the free spin scatter. They award 7 free spins. 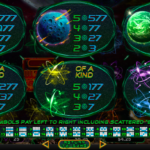 In the free spin game, you will see Red 7 Wilds on the second, third, and fourth reels. There is a re-trigger feature available. 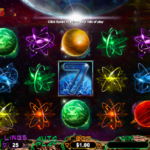 Supernova free spins come with a 7x multiplier. The Hypernova along with any wild flares over the entire reel. The wild remains at the same place for a free re-spin of the reel. This slot has a low hit ratio than other RTG slots. The game is super volatile and is perfect for all those yearning for some action. The features are entertaining and the payout is decent as well. For another great and engaging game you should consider playing Witch’s Brew by RealTime Gaming.